LIFE of BIM: splish splash! splish splash! Have I told you about my activity on Thursday? 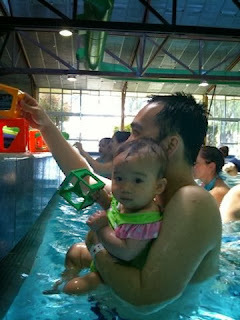 During school term Mummy and I go for Aqua playgroup, where my friends and I have tonnes of fun in the water. We sing songs while splashing the water, crawl through a tunnel (I don't like that yet), and play with toys. 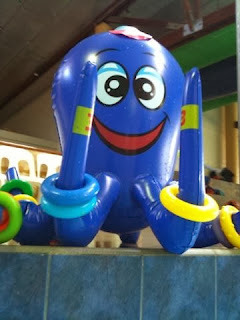 I can even swim with a giant octopus! Our instructor Louie is a wonderful lady, always with a big smile on her face and a loud voice so everyone can hear her. Sometimes she is a bit cheeky as she likes to pour water on my head. As now it is still school holiday at the moment, I can only stay at home on Thursday. 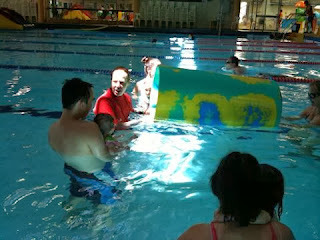 But let me show you some of the pictures taken during the open day of Mandurah Aquatic and Recreation Centre. I can stack the cubes! Can't wait for school term to start so I can swim like a fish again in the big pool with mummy!